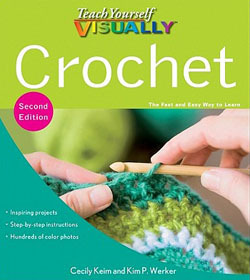 Thanks to Rebecca, a Crochet Spot reader, we have the book Teach Yourself Visually Crochet to giveaway! Rebecca loves this book and claims that it did a great job helping her learn to crochet. Her goal is to spread more “crochet joy” and help others to learn this fabulous art form. She donated a brand new copy of this book to Crochet Spot so that it can be given away to a Crochet Spot reader who would like to learn how to crochet or improve his/her crochet skills. Even though this book is great for beginners it is also a great reference guide for those who already know how to crochet the basics. To enter the giveaway, please visit the Teach Yourself Visually Crochet page on Amazon and click on the “Click to Look Inside” picture. Look inside the book to see what you are most interested in learning. Then leave a comment at the end of this giveaway post stating what you’re most interested in learning. Please stay on subject and only comment one time, multiple comments will be deleted. All participants must be either a Crochet Spot Newsletter subscriber or a Premium Pattern Member at the time the winner is drawn. If you are neither, feel free to sign up for the newsletter or a membership. Giveaway ends on Wednesday, July 13, 2011 at 11:59PM EST, where a winner will be randomly drawn. Good luck everyone and thanks again Rebecca for donating the book for the giveaway! Update: The giveaway is now closed. The winner will be announced shortly. Please check back later! This entry was posted on Friday, July 8th, 2011 at 12:34 PM by Rachel Choi	and is filed under News. You can follow any responses to this entry through the RSS 2.0 feed. Both comments and pings are currently closed. I would like to learn how to do filet crochet. I have seen some amazing creations out there are would love to create my own, kooky patterns. I would have to say measurements for making worn items fit better would be the thing I need to learn. I would love to make vests and sweaters but I sometimes even have trouble getting hats to fit people (mostly babies) correctly! I would like to learn finishing details, some of the fun motifs so I can create my own things as well as learning how to do beautiful filet crochet. I love to crochet! The Crochet for Knitters section looks helpful. I have a knitter friend that wants me to teach her! I am really interested in learning how to make a Lover’s Knot trellis, as well as the Tunisian stitches, which I never seem to find all in one book! I would love being able to see how to do the front and back post stitches. So many patterns use them, and I need help on those. This book looks great!! I would love to learn how to properly block a project. But there were also a variety of stitches I want to learn as well! Love this site Rachel! I’d love to learn about Stitch patterns. The image besides the heading shows a ripple effect and there are some lovely blankets that have that, but I can’t work the patterns out! I would like to explore the motifs and adding additional trims, edgings, etc. to my projects in order to make them really special. To learn how to follow a charted color pattern by stranding looks really interesting. I have looked at patterns using a chart, but it seems a bit intimidating. This book looks as though it explains things in an easy to understand way. I am most interested in chapter three- the sections about estimating how much yarn you need and how the hook affects the gauge. I have been crocheting for a while, but I could definitely benifit from some hints in that area! I am most interested in chapters 10 & 11. But the whole book looks great I lot of info. So many cool things to choose from! I think I would first be interested in “Mesh Fabric Using Crochet Arches” from chapter 9, and “Crochet With Beads” from chapter 11. The whole book looks awesome though, as I am a very visual learner. I am interested in the combining stitches section, although everything looks great! reading a pattern …….my wife would love this. I would love to learn how to follow a pattern and different stitches.. In these tough times, I am currently unemployed, homemade gifts for my grandkids have been the ‘goto” gift. Unfortunately I only know 3 stitches; slip, single, and hdc. And Im not quite sure I do those right. I have made them all afghans but wanted to do more. I found some really cool toy patterns at my local thrift store and would love to do them but I dont understand the patterns. I truely believe this book would remedy that. I would like to learn the tunisian stitch. Final Details and Finishing are the areas I would most love to learn about. I find that I can create a beautiful project, but if I mess up the finishing it can ruin the entire look and that is very frustrating. Finishing off gives me the most difficulty. Would love to learn more about this. I am most interested in Chapter 11 and learning to do the more unusual stitches. I am most interested in just learning the basics! I have known how to crochet for a long time. Well, I have known how to do a chain and single crochet. I still need to learn about yarn itself! I read the packaging, but most of it means nothing to me! So I am excited that this book actually starts with these basics. I am most interested in Chapter 2 I think, although Chapter 3 would be great too! I eventually want to get into the fancier stuff, but right now I just want to know the basics! I want to learn to read instructions better. I would love to learn to do filet crochet. There are so many awesome patterns out there but I really struggle to understand it. Chapters 10 and 11 look fascinating, since I’m a pretty basic crocheter. I find if I have clear directions, I can tackle more advanced patterns. The pictrues featured in the promotion look wonderfully clear and instructive. I’d love to win this book! It’s never to late to review the basics especially after a crocheting dry spell. I always have to try to re-design a pattern after I make it once using another stitch, yarn or by changing the size. A good read for pattern junkies when the language is unclear on an unfamiliar pattern. Thank you Rebecca. Making garments has alwys been a problem for me. I think the section on measurements might be helpful. I can’t decide if I’d like to learn the pattern design or some of the pattern stitches. I learned to crochet as a pre-teen, but hadn’t really done anything since then. I started crocheting again about a year ago and now I’m ready to learn it all!!!! Can’t wait to see who the lucky winner is, hopefully it will be me, but I’ll be happy for whoever wins!! I’m really interested in the section on broomstick lace. After I saw your summer broomstick lace scarf pattern I really want to master it so that I can make the scarf. Thanks for having the giveaway! I would like to learn how to diagnose and fix mistakes. Thanks for the giveaway! I want to learn the Tunisian and some of the special stitches. I am interested in learning more complicated stitches and different joining methods for motifs. I have always used a Loom and would love to learn without it. And It would be neat to make a clutch purse!!!! I would love to learn the granny square bag! I am just beginning to learn crocheting and really have sooooooooooo much to learn! This would be a wonderful learning tool for me. I would really like to learn non-standard techniques and then how to combine stitches (latter chapters). I would love to learn the Tunisan Stitch and all about it! I am interested in learning different special stitches., motif’s, details and finishing! Thank you! I just have to learn filet crochet! Such pretty designs you can make with this. Also still trying to learn the granny square past the 2nd row. I would like to learn Motifs and joining colors. Crochet is so fun, I wouldn’t mind learning the knitting techniques too.. I would like to learn new crochet techniques. I would like to learn about the different ways to work in the round. I have become fascinated lately with circular patterns and this would help me in my quest to understand them. It is generally pretty difficult for me to find a good crochet book that I would love to add to my crafting corner and I think this would be a great addition to my small but greatly appreciated book library. Anything from Chapter 9 thru 14. There is so much great information there, that it’s impossible to specify just one or two things that I would use.